DEDHAM, MA, ISSUED NOVEMBER 15, 2014…The Exit Planning Exchange (XPX) Boston announces that Terry Phinney of Dedham, Massachusetts will chair the 2015 XPX Summit. Phinney, who was named to the XPX (Boston) Board of Directors earlier this year, will lead the annual Summit, which will be held at Waltham Woods Conference Center. The Summit is planned for March 19, 2015. The “Progression of Succession” will be the featured topic. 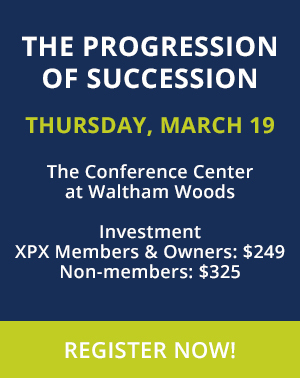 Numerous owners and advisors will share their practical knowledge and experience on preparing for and successfully executing business succession. Topics will include growth capital, ESOP’s, internal ownership transition, management and leadership succession and sale. Phinney is a Principal of Blackstone Management & Consulting (www.blackstonemgnt.com) in Dedham, Massachusetts. Blackstone is a business consulting firm that helps privately owned companies improve their performance and competitive position. The firm specializes in profitable growth, improving operations and building organizational capabilities. Terry has been a featured speaker at the Annual Conference for the Cape and Plymouth Business Journal, the XPX Summit, the Family Firm Institute Annual Conference and the Annual Meeting of Deutch and Company in Sarasota Springs, New York. Phinney has also authored numerous industry articles on succession and organizational improvement.